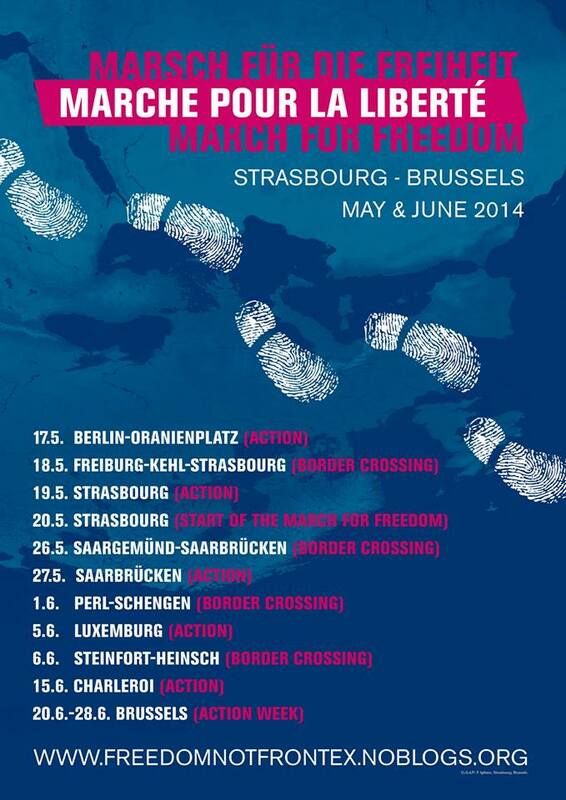 On 18th May 2014, over 200 refugees and supporters began a 450 km March for Freedom to Brussels, crossing the bridge from Kehl (Germany) into Strasbourg (France). Dutch poet and no-border activist Joke Kaviaar, and German street photographer Andrea Linns, were among them. Organised by Freedom not Frontex and supported by several local activist groups along and beyond its itinerary, the March for Freedom is a peaceful, festive yet resolutely determined protest, aiming to raise awareness of the plight of migrants within and outside the EU frontiers. The softening of borders within the Schengen area has led to a hardening and militarisation of the EU’s external borders, transforming the Mediterranean Sea into a moat and collective cemetery around Fortress Europe. For those who survive the crossing, the infamous Dublin II Regulation, hand in hand with national policies, continue to restrict their freedom of movement within Europe, where discrimination, detention and deportation have become the order of the day. After three more border crossings, the March is due to arrive in Brussels on 20th June for a full week of actions and events, in time to capture the attention of European leaders attending the European Council Summit on Migration Policy. Supporters joining the March have left their passports and identity cards at home as a symbolic gesture, and to make it more difficult for police to single out the most vulnerable demonstrators if arrests are made. On Sunday 1st June, the March will make its third border crossing, across the Moselle bridge from Perl (Germany) into the symbolic village of Schengen (Luxembourg). For the occasion, Personne n’est illégal – Luxembourg are planning a mini-concert and poetry reading in Schengen to welcome the March, and are taking care of all logistical issues during the marchers’ five-day crossing of the country. Come and support us! 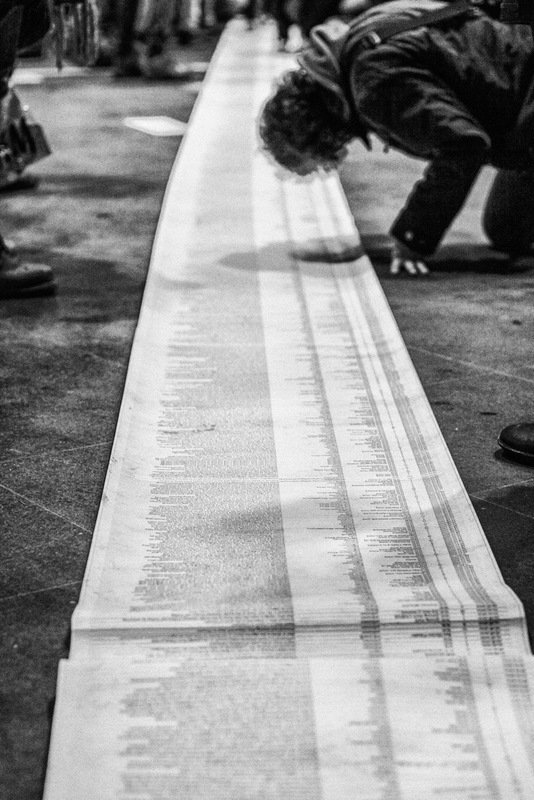 A list of over 20,000 migrants who lost their lives at Europe’s borders, rolled out at the Berlin Hauptbahnhof. Photograph by Andrea Linss. Read Joke’s report of the first two days of the Freedom March to Brussels on the noborder.nl website. Joke Kaviaar is a writer, poet, performer, anarchist and no-border activist. Despite having been prosecuted and censored in the Netherlands for ‘incitement’ in her poetic writings, she remains as active as ever. Born and bred in Berlin, Andrea Linss is a street photographer dedicated to documenting the growth of urban protest culture. Her camera focuses on the human being – daily routines, urban gentrification, social hardship and the plight of asylum seekers, and creative resistance to capitalism. See her Flickr photo stream of the March for Freedom here. This entry was posted on 22/05/2014 by mondepasrondeditor in activism, events, photography, poetry and tagged Andrea Linss, borders, EU, France, Frontex, Germany, Joke Kaviaar, March for Freedom, migration, passports, refugees.